A very fast fifth running of the bulls of Sanfermin 2012 and also a very clean run. The bulls from the Fuente Ymbro bull ranch in Cadiz ran together over a large part of the course. While there were a lot of trip-ups and falls along the different stretches of the course, from both the runners and the bulls, it seems that none of the runners received any gorings from the bulls. The pack come out of the pens close together and ran up the slope of Santo Domingo in a tight group. At the end of this stretch, a black bull raced ahead of the others and lead the pack at a very fast pace. It was soon accompanied by the heaviest of the bulls, an off-white colored bull, that joined it as they crossed Mercaderes. Both bulls crashed into the fencing on the corner of this stretch and slipped to the ground. This gave their companions coming up behind the chance to catch up with them again and all the bulls entered Estafeta Street together. . Here the distance between the bulls began to gradually widen somewhat and the runners were able to show off their skills, getting in close in front of the horns of the bulls. The bulls all reached the bullring at a fast pace. The rear bull, “Infundio”, came in alone to the bullring totally spent out and it fell several times in the arena which meant that it took some time to get it to enter the safety of the pens and in the end, the whole running was completed in a time of 3min. 12sec. The 145th time that there were no gorings in a running of the bulls. The previous was on 07/10/2012. In 8 this was the 5th time that the Fuente Ymbro did not cause any gorings. 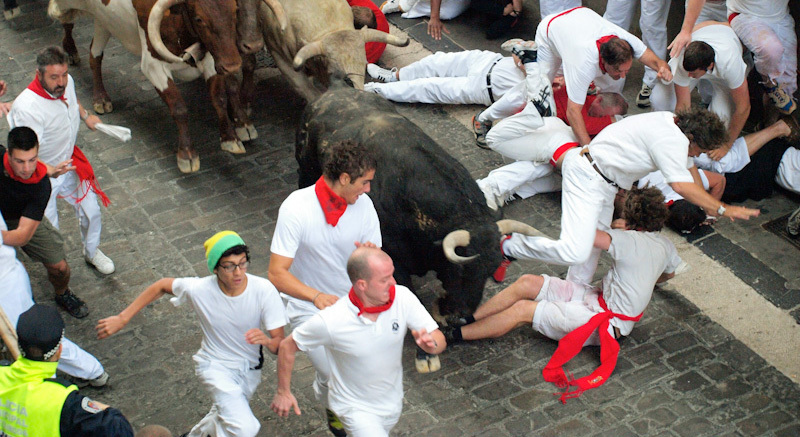 In 8 participations the Fuente Ymbro have caused 27 injuries from bruising (3,38 per running of the bulls). Fuente Ymbro is the 12th bull-ranch which causes the most injuries from bruising (27 in total). Among the 8 running of the bulls of Fuente Ymbro in Sanfermin this has been the 3rd longest (3'12''). The slowest was on 07/09/2010 (6'23'').